That's a real treat in my books! Wow Priya, they look quite a nicely filling muffins to enjoy as a breakfast meal. OMG! A real delightful treat dear. Yummy muffins. love those flavourful cute muffins!! Love this Priya as both Nutella and Bread are my favorite ingredients... Will try this out soon - bookmarked !! Sure a treat for kids with nutella and cinnamon flavor! Very tempting muffins with gr8 flavors.. This is simply scrumptious, can't take my eyes out of it. Wholesome muffins. These look yum!! 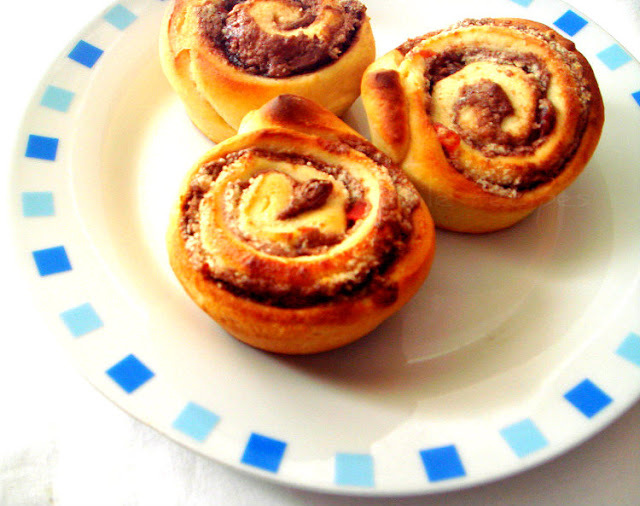 Add nutella and you are assured to catch the kids attention :-), the swirls look perfect Priya. Nice muffins. Was looking for recipes with nutella earlier in the day and then now, this one! Yeasted muffins loooks delicious, healthy with whole wheat. Very tempting, love everything that has nutella! this looks totally yumm. love to have it any time of the day. soft and fluffy..